Mix soy sauce and Sriracha hot sauce in a small bowl. Heat oil in a large nonstick saute pan over medium high heat. Saute mushrooms, carrots, peas, and scallions 2-3 minutes. Add brown rice, soy sauce, and Sriracha and fold in. Let brown rice sit and cook without moving for one 1 minute to crisp a little. Remove fried rice from pan into a bowl. Return the pan to heat and fry eggs. 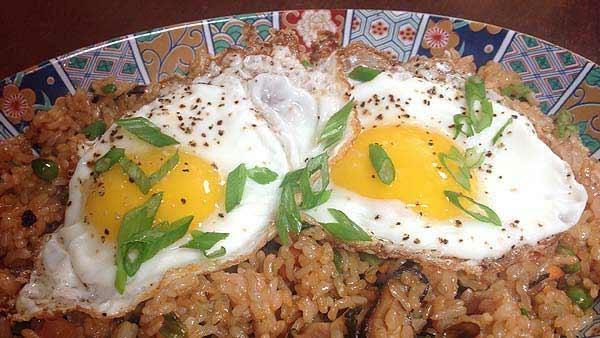 Serve fried rice in a bowl with a fried egg on top.